Fyndoo offers effective solutions for all stakeholders in the business financing chain. Access to financing for entrepreneurs. Smart advise tooling for accountants en advisors. Full support for originating and managing of financing solutions for lenders. Fyndoo has a visual interface and is intuitive to work with. Because Fyndoo is offered in the cloud it is accessible for all users, 24/7, anywhere in the world and on every device. This way Fyndoo unburdens you from technical considerations and cost of ownership with proven technology. We offer the most advanced solutions to our users by continuous development and partnering with other parties. Fyndoo's modular architecture enables our solutions to be used combined or separately. 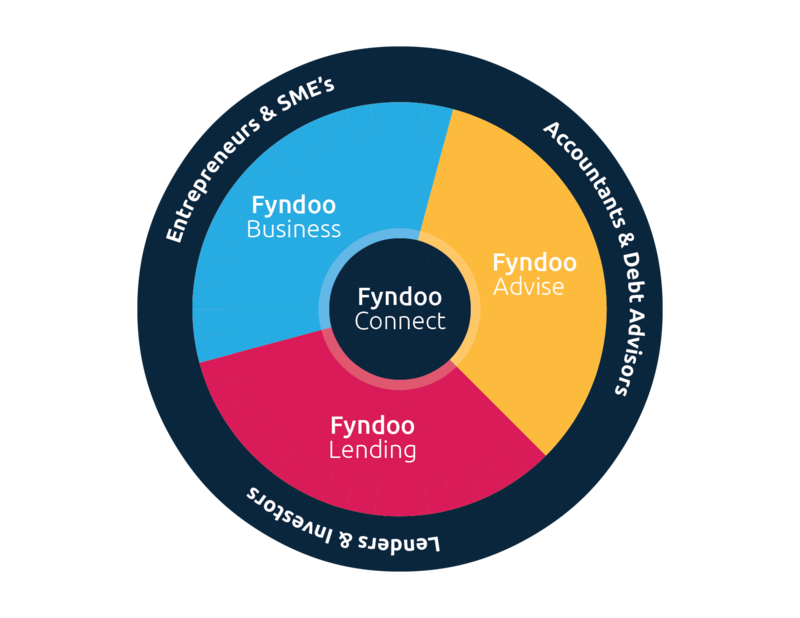 Fyndoo offers solutions for entrepreneurs, accountants, financial advisors and lenders. Fyndoo Advise helps you as a professional to analyze and shape the financial future of your client. Fyndoo Connect is the connecting link between all Fyndoo solutions, your own systems and the rest of the world. With our smart solutions you always have access to the relevant information.